The damage to the pavilion. Only the concrete and these koa carvings by local artist James Jung were salvageable. 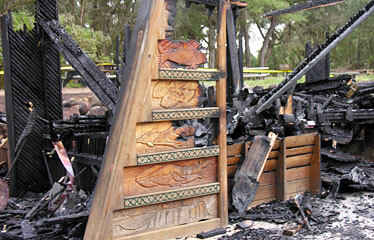 WAILUA, Kauai » A park pavilion built by dozens of volunteers, from toddlers to grandparents, was burned to the ground Thursday night, and police said late yesterday they had a suspect in custody. Kauai police would not identify the suspect, who has not been formally charged, officials said yesterday. 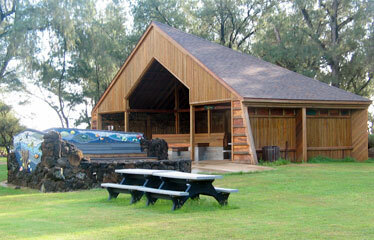 The pavilion at Lydgate Park was built in 2004 by volunteers from a cross section of the Kauai community. It will surely be missed, said Thomas Noyes, general coordinator for the Friends of Kamalani and Lydgate Park volunteer organization. "It was an expression of love by the whole community," he said. Noyes said he talked to witnesses who saw a fire burning in the pavilion at 6:30 p.m. Thursday. Officials said firefighters arrived at the scene just before 8 p.m. The fire was extinguished at 10:26 p.m.
"My initial impression is that this could be chalked up to stupidity and carelessness rather than maliciousness," Noyes said. "Hopefully the official investigation will uncover a complete set of information." What the pavilion at Lydgate Park looked like before the fire Thursday night. Volunteers built the pavilion in 2004 to give community groups a place to gather at Lydgate Park. Tim Bynum, former coordinator for the Friends of Kamalani and a current Kauai County Council member, said the structure "was a piece of art," from the ceramic-tile fish embedded in concrete to the wood carvings and murals built into the walls. Damage to the 880-square-foot wooden structure is estimated at $100,000. The pavilion contained a 25-by- 40-foot stage, with a small concrete amphitheater surrounding it. The building was used daily as a gathering place for families and for impromptu concerts and plays, Noyes said. Bynum said it was intended to be used by large groups camping in the area, such as the Boy Scouts and the Girl Scouts, or church groups. But despite the area's use by the homeless, camping has not been permitted in the area. The structure will be rebuilt, Noyes added. "Everything I've heard from volunteers is it's a tragedy," Noyes said. "But Kauai is good at rebuilding." The Friends of Kamalani, which built the original structure with leftover materials from the nearby Kamalani Bridge, are accepting donations. A fund has been established care of the YWCA of Kauai, 3094 Elua St., Lihue, HI 96766.